Free Shipping Included! 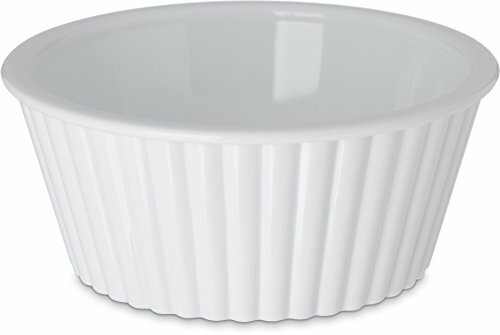 Save 1% on the Carlisle 084502 SAN Fluted Ramekin, 4.5-o.z Capacity, 1.50 x 3.50'', White (Case of 48) by Carlisle at OD Network LI. MPN: 084502. Hurry! Limited time offer. Offer valid only while supplies last. The Carlisle 084502 SAN fluted ramekin is round, white, and suitable for holding and serving butter, salsa, a sauce, a condiment, or another food. The Carlisle 084502 SAN fluted ramekin is round, white, and suitable for holding and serving butter, salsa, a sauce, a condiment, or another food. The ramekin is made of SAN (styrene acrylonitrile resin) for durability and resistance to heat and is dishwasher-safe. The rim helps prevent drips and spills. The ramekin measures 1.50"/3.81 cm high, 3.50"/8.89 cm in diameter at the top, and 2.62"/6.65 cm in diameter at the base and has a 4.50 oz./0.13 liter capacity. It is free of BPA (Bisphenol A) to address food safety concerns raised by the U.S. Food and Drug Administration (FDA) and other organizations, and it meets NSF International/American National Standards Institute (ANSI) Standard 2 for use in food handling and processing.